I am painting landmarks from the urban landscape, sourcing subject matter from my daily commute, places that I pass on a semi-regular basis. Sometimes to expand the subject matter I will change the route I travel. At the moment I catch the train, getting off at Sydenham and walking to my studio in St Peters so, that little journey is giving me some more material to work from. I am working towards a new exhibition. I have been starting the painting in acrylic. I find that it is the easiest. I don’t need to use any medium just block in the basic elements and then finish with oil paint. Acrylics produce brighter, stronger colours and dry quickly that seems to suit the process of beginning a painting. The oil paint is much easier to work subtle shading, subtle colours. Finishing the painting with acrylics can be quite frustrating. At Tafe I went through 3 years where I only painted with acrylics. I moved to oil paint when I went to National art school because they didn’t allow us to paint with acrylics. I am pleased that I was forced to do that. AJ: You don’t use any grisaille in under layers? You go straight to colour? Often I restrict my palette, with colours one step removed from pure primaries, so pthalo green in place of blue, alizarin in place of red and Australian red gold in place of yellow. I do most of the painting just using these colours and dip into other colours only if it is needed. This creates a kind of tonal relationship between the colours. AJ: Do you use gouache or watercolour at all? I haven’t used either for a while. I have done ink wash drawing more recently, which I enjoy. A lot of those were done plein-air. This may be why I enjoyed them so much. I think the plein-air experience is more satisfying because there is a greater experience attached to the task of painting, especially if it is a nice day. It’s a more holistic experience. I do use photographic material for most of my paintings. The road-based landscape doesn’t always provide the plein air painting opportunity. One of the reasons for painting subject matter that I encounter on a regular basis is, it takes time to get familiar with the things that you are painting. I need to see the subject in various lights, various conditions. The problem with painting from a photo is that you got only a split second view how it looked to the camera with it settings at this particular moment in time of the photo, and atmospheric space is often lost. So, I repeatedly visit a site and take a lot of photos before I begin painting it. Working from a range of photographic references can result in a painting with inconsistent lighting. But, that happens painting plein air anyway, because if you sit there for the duration, the light changes and you are going to respond to the most appealing elements at each point. So, I have decided that I don’t always need to rationalise the light in the painting: I can combine various lights within the one work. AP: Figure or no figure in the landscape? … most often I don’t see any figure in your work, why is it that you don’t feel the need to do so? Well, I have occasionally put figures in and the times that I did, it just seemed…. well there just happened to be one there and he seemed to in the right place, the right time…. AP .. like….part of the landscape? Yes…. in one instance a hooded figure was approaching whilst I was taking photos of a building across an intersection. He reached the traffic lights as I was trying to work out what to do with the road space, and turned to look at me. This electrified the empty space between my side of the road and his…so…. the figure went in. AP I remember this painting, the old garage? So to answer the question I usually don’t put figures in… They tend to render the landscape as a backdrop setting. The space becomes very literal, just the setting the figure is occupying. And I would like the space… Well, I think that partly I like the emptiness of the space… even though I am painting familiar places there is a sense of strangeness or emptiness, a sense of melancholy, that I like and… sometimes a figure will spoil that. There is also an interest in the formal geometries presented by architecture which allows the painting to develop on a semi abstract level. The figure doesn’t really belong in this context. I also rationalise that if I was painting plein –air the figure wouldn’t be there long enough to paint. And anything that is moving, traffic, anything that is in transit shouldn’t show up in the slow process of painting. I was 9yrs old and wandered into a backyard studio of a family friend and stumbled on a series of paintings in progress. They where landscape paintings…. country roads, homesteads, with dramatic skies. They blew me away. I think that you don’t move far from the first impulses…they are the strongest. For many years of my youth I was self-taught, and largely responding to the landscape wherever I was living. At that time I was living in outback Australia so I was painting rural landscape mostly. At one point my parents were working in Alice Springs so that is where I learned watercolour painting from aboriginal artists. We were living in Broken Hills when I was 9. I used to go and visit Pro Hart’s gallery and my first paintings were probably copies of Pro Hart landscapes, red desert landscapes…. Just recently I Google searched and went to Street View some places where we lived when I was young. Some are looking much the same as when we lived there. The first house in Broken Hill was on a dead end stretch of road to nowhere… called the “Old South Rd”. It had been replaced with a new road that included an overpass. At NAS I was doing still-life painting at the beginning of 3rd year, looking for potent cultural symbols in still-life arrangements… somewhat similar to what you are doing… The head of painting said that my subject matter was letting me down… then we went to Cockatoo Island and I did a painting of the crane… big looming form…. almost like a country cabin suspended in the air above the water… I enjoyed painting that… So I thought, I am going to look for big looming forms and I started painting over-passes. Often you can link the things that interest you to early childhood, I think. AP: …and possibly things that did have an emotional impact at the time and possibly, not just over-passes but also there is always the presence of a road, or something leading to somewhere? Yes….. we lived a fairly nomadic lifestyle.. so that sense of being in transit was very common to my childhood. If you were to live in the countryside, do you think you switch to a more traditional representation of the landscape, without houses or buildings? Or what really resonates with you is the structure of the human building in the landscape? Yes… I had a 3 month scholarship to the British School at Rome in 2011. Initially I entered into the experience of a tourist, travelling and seeing sites that I wasn’t familiar with, there was all the excitement and wonder of being outside of a familiar environment, seeing new things. After some time I tried to reduce the scope of what I looked at and established routines that allowed me to come back repeatedly to places so that I would become familiar enough to feel it was OK to paint those things. I don’t know why, but I am not inclined to paint things experienced in “one-off” encounters. I painted a portrait once, of someone I had never met, as a commission, and I hated that. There is a feeling you have to know something before you paint it and painting is part of the process of coming to know something. Rome brought a sense of connecting to history. When you are painting the relics of things that are 2000yrs old… it feels profound. They were in the process of returning to nature. And I think that those paintings became a little more picturesque than what I had been doing previously. A more “organic” feeling came through, and I think that has allowed me to be less geometric with some of these paintings. In coming back I have tried to bring the eyes of a tourist to the familiar because we often become less conscious of the things that we see every day. I try to find that same wonder in the places that I encounter on a regular basis. 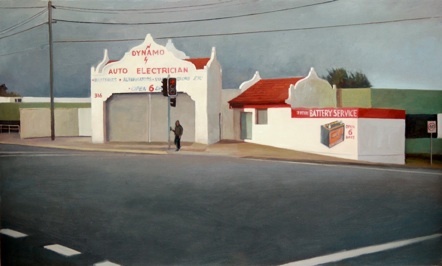 AP: after your residency where you were exposed to places that were much more ancient and had that cultural depth, coming back to Sydney, do you think you are also trying to record the historical value of places you choose to paint? There is often older buildings juxtaposed with newer building. So is there an historical intent or are you mostly interested in geometrical settings and the light? Content vs. execution? Well… that is the problem with asking a painter why they do things… often we don’t know ourselves. It is like asking a dancer why they move a particular way. You just respond to the music. There were definitely paintings from the last show, like the old chimneys, that had a sense of nostalgia about them. There were a lot of historical subjects, Tempe House, that old church… St Magdalene chapel… so I think perhaps, that is one of the things that I respond to, a feeling of something enduring… The vacant shop in Tempe was interesting because it wasn’t something important. 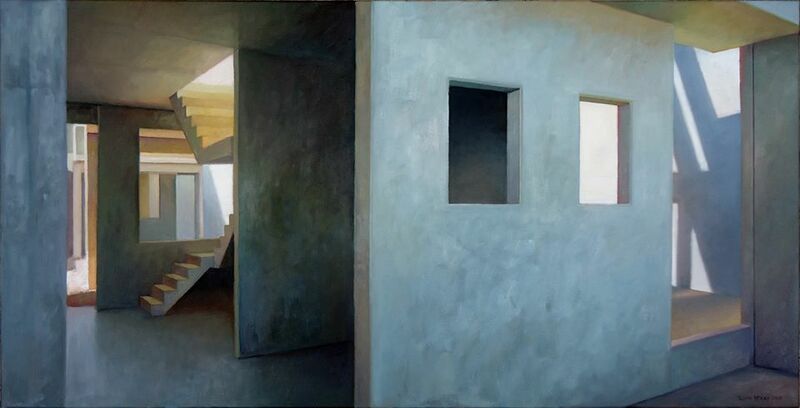 It can be difficult to paint a place that is too obviously important, like the harbour bridge or the colosseum. Some things are just too great to approach. But I enjoyed painting that vacant shop in Tempe… We wonder about the history behind it. It is a neutral enough subject that remains an open metaphor we can each bring our own meaning to. Now…. That question about geometry…. See that painting? That house was under construction…. That felt to me it had a lot of things in common with the ancient ruins and yet rather than being old it was so new, it wasn’t completed yet. It has a classical simplicity in that unfinished state. It is not decorated, it’s open, and so it is similar to an ancient ruin. It is a place with utilitarian geometries but its also got emotive light and shadows. But this is home for me. Coming from somewhere else, and living in lots of different places as a child has given me a transitory experience. Even now, although I have been living in Sydney for quite a long period, there is still a feeling of transit, of not being rooted deeply in one place. I think that the positive of that is…when you come as an outsider, the experience of a “tourist”, you see things that are different, compared to what you have known. If you don’t travel, you take for granted that what you know is how it is. You are less aware, less conscious of things. So being slightly on the edge of things allows you to be more aware. Edward Hopper would be my favorite painter. I quite like Morandi as well, even though he is a still life painter: he is very clever, there is a formal quality and sensitivity, he is playing with lots of opposites. And I think that as artists we like opposites, something working against something else…. I also like Jeffrey Smart and Rick Amor. Amor has a more romantic aesthetic compared to Smart’s cool analysis. The subject matter tends to find me. If I think too much about it, it kills the process, the sense of discovery, of finding something is important to me. I had no idea I was going to paint that before I discovered it (pointing to the unfinished house painting). So the subject matters are often a gift. They just happen. I think about how Hopper said all he needed to paint was sunlight on the side of a building. The architectural form is almost there to enhance the things outside of itself, so the more ephemeral elements of space and light can be articulated. This is an environment that surrounds us, it regulates our lives: if you have to travel from Lane Cove, you are stuck in the traffic, you can’t get off where you want to get off, you can’t turn right when you want to turn right. Somehow by standing apart and doing a picture there is a sense of exercising control over a space that tends to control us. In the 60s there was a group called “The Situationists”. They believed we were losing original personal experiences and the fetish commodity and spectacle have become substitutes for an authentic life. So they encouraged people to break their routines, put aside all the things they normally do and have a unique experience with the urban environment. This was described as a “derive” (from the French) meaning to drift. I like that idea. I think the reason why I don’t feel compelled to paint the natural environment, besides not living there, is that THIS (the urban landscape) is increasingly the reality we have to deal with. In the Romantic period artist’s responded to the grandeur of nature as “this thing that is bigger than us”. Paradoxically, the man-made space has reached similar proportions and we are at risk of being overwhelmed by our own constructions. 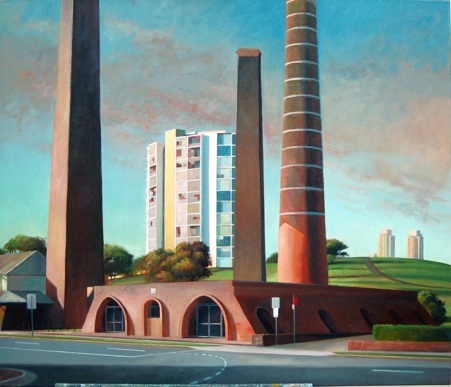 Kevin McKay is working in Sydney and I visited his studio for this conversation in the first week of August 2013.